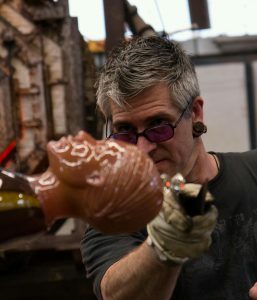 Ross Richmond began working in glass in 1991 at the Cleveland Institute of Art, where he received his B.A. in 1995. He worked for Dale Chihuly, Preston Singletary and became a key member for William Morris’s team prior to becoming an independent full-time glass artist. Richmond focuses mainly on the human figure in his glass sculpture. Many of his figures seem to be captured in a moment of introspection or in a symbolic gesture. Ross frequently teaches at Pilchuck Glass School in Stanwood, Washington and at Penland School of Crafts in Penland, North Carolina. His works can be found in major collections in the U.S. and abroad.